He does not want a cat box in our house. But, Buster , HIS DOG, is preventing our new cat from using the dog door and going outside. We didn’t want another cat. We had two cats already. But, no stronger crusader for saving downtrodden animals exists than my daughter. Biggs, the cat, was down on her luck. And Heather was determined to save her. Biggs, had been Heather’s grandmother’s ( my ex mother-in-law’s ) cat. She had a good life. The food bowl was always full. Biggs had toys. Biggs had catnip. And her antics made her the center of her elderly owner’s lives. Then my ex mother-in-law entered her final stages of cancer. She became confined to a hospital bed moved into her living room. Biggs became a permanent fixture on the corner of the bed. Hospice workers and family and friends came and went. Biggs was admired and petted by all. But, Bigg’s life was about to take a turn for the worse. My ex mother-in-law died. My ex father-in-law’s health deteriorated and he had to go into a nursing home. Poor Biggs, at the age of five, after spending all of her life in a loving comfortable house, was given to a duck farmer and tossed outside to make her own way. My daughter lives in California. But, she worried about Biggs and looked her up every time she visited. Overjoyed to see one of her people, Biggs never failed to greet Heather as a long lost friend. She would crawl into my daughter’s lap and purr and purr and purr…when Heather left, Biggs tried to follow her crying. Things did not get better, either. Biggs found a way to get in the machine shop to stay warm. Soon she was covered from nose tip to tail tip with black grease. The duck farmer was given a black lab named Buddy who barked, chased, bit and mauled poor Biggs. Heather’s pleaded for DH and I to take Biggs. I was stubbornly saying DH and I had enough cats and that her “father” should take the cat when Biggs got her tail caught and broken in a machine shop machine. That did it. Biggs spent her first days on our farm, in our house, upstairs on one side of a door with her new cat brothers, Kitty and Simba, sniffing and growling and hissing on the other side. Buster and Abby, our dogs wanted no part of a cat fight. They stayed as far away as they could. I worried that we had made Bigg’s life even more miserable by bringing her into a house full of animals. Kitty and Simba behaved as if DH and I had committed adultery by bringing “another cat” into “their” home. I was sure if they met Biggs, face to face, fur would fly. The slightest bark downstairs would send Biggs up the nearest piece of furniture. It didn’t look as if she would ever get over her “bitten-by-Buddy” trauma. Fortunately, cats and dogs are resilient and forgiving. They don’t carry baggage or harbor grudges the way people do. 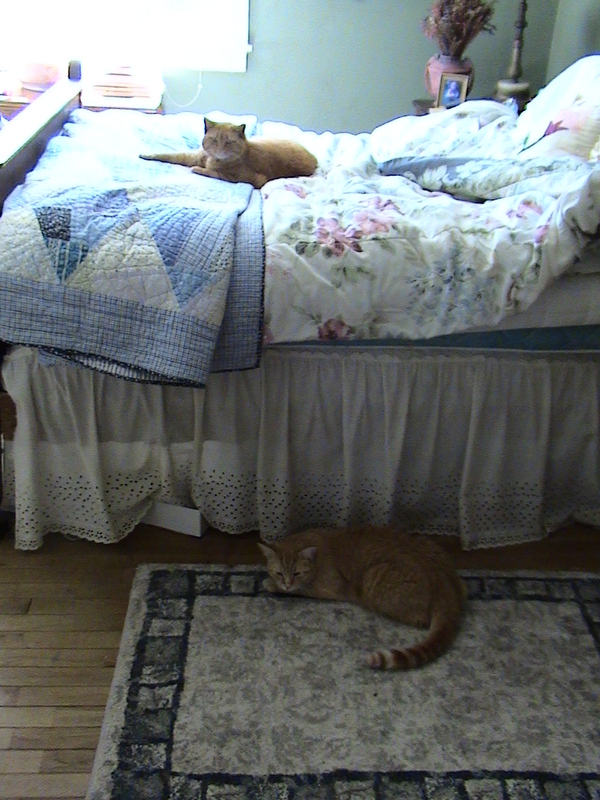 After only a few weeks, Biggs is now coming downstairs with Simba and Kitty in the room. They will get a swat across the nose for sniffing or getting too close. But the growling and hissing has stopped. To get to the food bowl, Biggs walks past the dogs. If they are lying down, that is. We have only to resolve the cat box situation. DH thinks Biggs is ready to learn to go out the dog door. Buster has a quirk. Cats that are inside are family members. Cats that go outside through the dog door get chased up a back yard tree. Buster lives for the sound of the dog door flap. DH says he will train Buster to stop chasing cats when they are outside. Then he says that even IF Buster DOES chase cats it is all a game and that Buster would never actually HURT a cat. I don’t care that Buster won’t actually HURT a cat. Poor Biggs would be traumatized if she were to be chased. She trusts us. The poor cat has been through too much already. DH says the cat box makes the whole house reek. And so the lines have been drawn. (The picture at the top of this post is of Biggs (cat on the bed) & Simba (cat on the rug). We are working on the litter box situation by escorting Biggs outside and giving her the opportunity to do her business there. The only problem is that she doesn’t like having to come back inside. It is kind of a pain to have to round her up when we get tired of being outside. Bless you for helping out this sweet cat who ushered her original owners out of this world. Bless you! The litter box, the going outside, it’s all small stuff. She sounds like she will be a great blessing to you. There are cat litters out there that are pretty odor free . . . . I have a cat Smokey who thinks that the litter box is some sort of satanic torture device. Not only that, he believes that no one ELSE should use the cat box either, and so when Mike uses it Smokey will whap him up alongside the head. This makes Mike into a “commando” cat box user, and as soon as he has sneaked in there and made a deposit he comes and tells me to clean it out. I use clumping litter, the kind made by Arm and Hammer baking soda people. If you scoop the urine and feces out every day and dispose of them, the cat box will not reek. It seems like the scoopable cat litter is more expensive, but actually it is quite economical because you never have to dispose of the whole contents of the box, just scoop out what has been used. I highly recommend it. My cats prefer it too. Thaniks healingmagichands and intlxpatr for your suggestion of the odor free kitty litter. I think it is more of a matter of the idea of a cat box in the house than the actual smell that was bothering DH. Fortunately, we have the problem semi-resolved. I need to post how we handled the cat box situation and how Biggs is doing. But I’ve also taken pictures of another pie I just made. And I took pictures of the Amish farms where I buy my flowers and produce and brown eggs. Unfortunately, I am better at coming up with ideas of things to write about than I am at actually doing the writing.